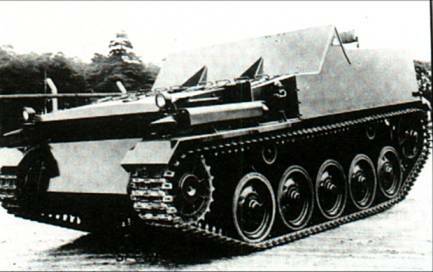 This was intended as a series of light armoured vehicles, dating from 1947 when the War Office envisaged three complementary series of vehicles, the FV200 series heavy cruisers, leading to Conqueror, the FV4000 series medium cruisers (Centurion) and the FV300 series of light armoured vehicles. This latter series was to include a light tank, FV301, based upon A46, a command vehicle, FV302, two SP guns, FV304 and FV305 and an ammunition supply vehicle, FV309. In the event, only the basic vehicle was built in the form of two prototypes. These used the Meteor engine with TN10 gearbox, and these plus the cooling fan were all assembled in one unit that fitted on rails, enabling simple removal from the vehicle - one of the first instances of a single removable powerpack in a tracked vehicle. The suspension employed a dual torsion bar system which offered manufacturing advantages. 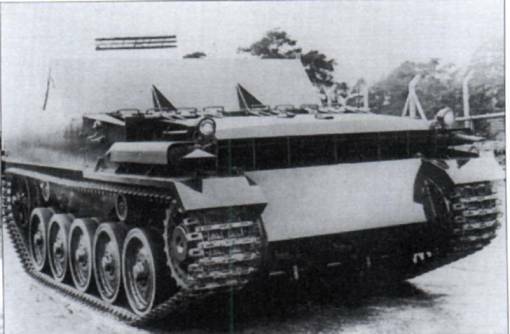 FV300, although never developed into the originally intended series of vehicles, provided the basis for the development of Vickers Vijayanta (conceived 1959, first Indian production, 1965. Production ended early 1980s) and the closely related Vickers Mk I MBT (used by Kuwait and in service at the time of the Iraqi invasion).